Avery Holleman is a designer who’s counting on PCs to become massively more energy efficient and compact with his concept of a Napkin PC. 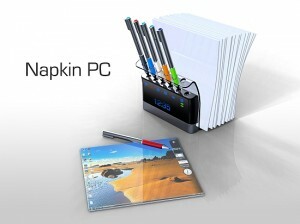 The Napkin PC is ideal for collaboration as you just share the Napkins (which are the displays). The Napkins all inter-operate wirelessly with the control station. 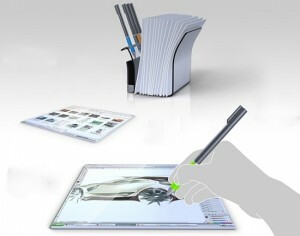 You can then interact with the displays using the special pens. The napkins would be ideal for design work, or sharing ideas without the need for paper or printouts. Additionally, the napkins can be worked on in parallel (akin to having many screens on a PC or using multiple desktops within Mac OS X or Linux). The internal battery for the displays could be charged using inductive chargers, meaning the system could be truly wireless. 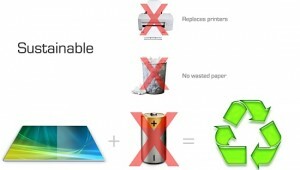 Ideally, when the displays wear out or become damaged, they could be recycled in some way. A great concept, but I think that we’re about 5 to 10 years off yet!